My grandma made the best food. She made real, homey recipes; the kind that grandmas are supposed to make. There were wonderful casseroles and buttery vegetables, but the best were her baked goods. From elaborate baklava to easy drop cookies, she always had yummy treats on hand. One of my favorite things that she would make was something simply called Rhubarb Dessert. I don’t know if it qualifies as bar cookies, or a coffee cake, or what exactly, but it was tart and buttery and amazing. And I wanted to make some myself. I am proud to say that I inherited some of my grandmother’s crafting ability and cooking skills. Unfortunately it seems that poor recipe documentation also runs in the family. Just as I tend to cook with “handfuls” or “dashes” of ingredients, my grandma’s recipes are frustratingly unclear. This particular recipe of hers didn’t even mention how much rhubarb to use! Just “enough to cover the crust.” Hrmm. In order to be able to replicate the recipe down the line, for my sake as much as yours, I tried to pay close attention to specific amounts and measurements as I made my grandmother’s recipe. It’s a very simple dessert to make, but it’s slightly easier when you know how much of everything to put in. My grandmother’s recipe calls for shortening in the dough, but I didn’t have any on hand. I am sure that the shortening is what made her crust slightly more flaky than mine turned out to be. Feel free to use either her recipe or my substitution for your version. 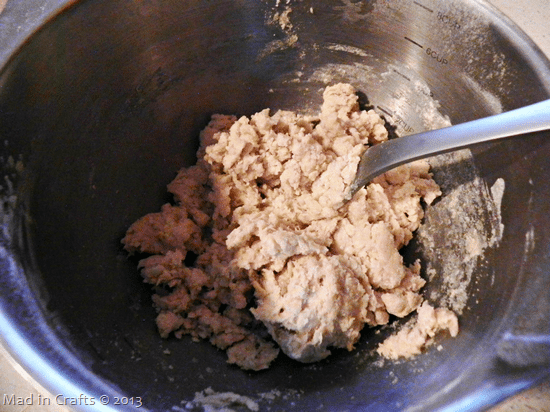 The dough will be not quite as crumbly as shortbread dough, but not as gooey as cookie dough. Press the dough into the pan with your fingers. There’s no use trying to be sanitary and using a spatula to press down the dough, it will never work. You will need the warmth of your fingers to get the crust to spread all the way the edges of the 9×13 pan. Made with love, folks. 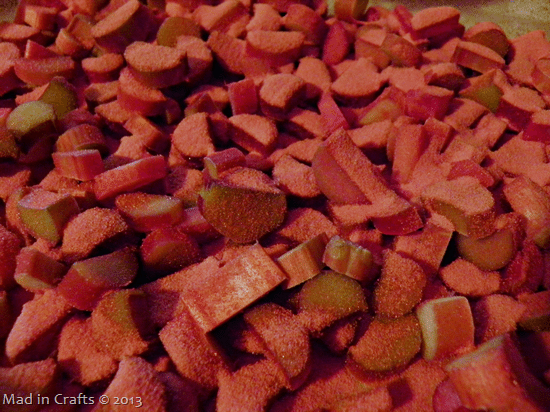 Dump the cut rhubarb over the crust and sprinkle the whole thing with a package of strawberry jello. The jello is what makes the magic happen when you bake the dessert. 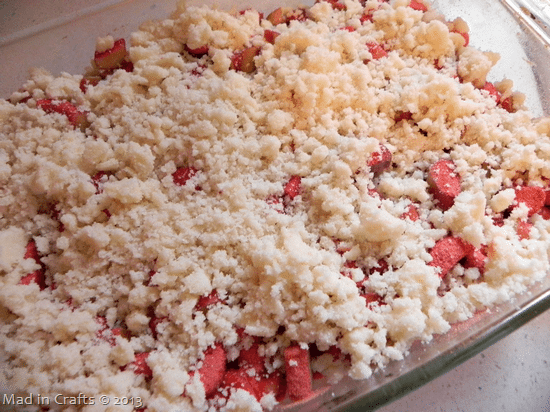 Mix up the streusel ingredients and sprinkle it all over the rhubarb. It’s a lot of streusel. There is no such thing as too much streusel. I am not sure exactly how long to tell you to bake the dessert. My grandma’s recipe said to bake it “until the rhubarb is tender.” Helpful. I tried to get an accurate time from my version, but the oven got turned off halfway through bake time, so I have no clue how long it would have taken if a non-idiot was baking it. If I had to guess, I would say to start checking the oven after about 30 minutes. You want the crust and the streusel to be golden. This dessert is so good. 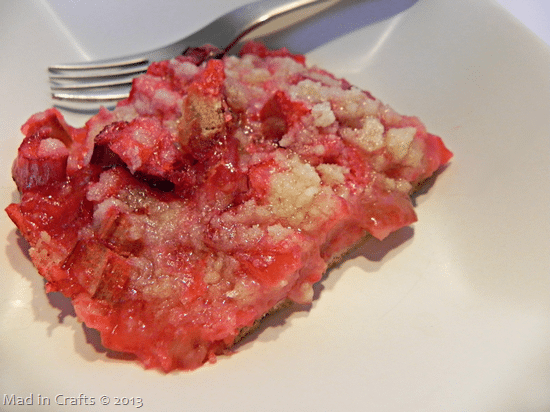 The jello combines with the moisture of the rhubarb to make a gooey filling, and the streusel is so buttery that it balances out the sour tang of the rhubarb. My family polished off this whole pan in an embarrassingly short amount of time, so I already have my eye out for more rhubarb to make another batch. Mix in shortening (or oil and butter). 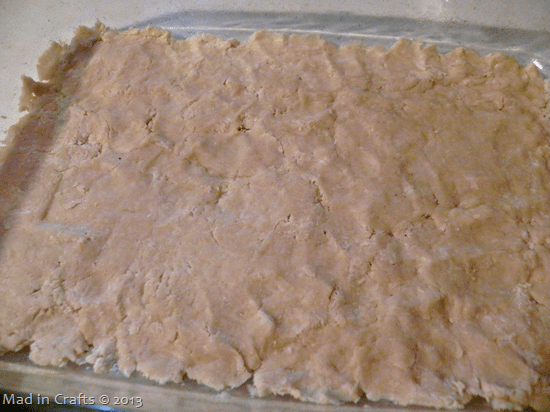 Press into a greased 9×13 pan. 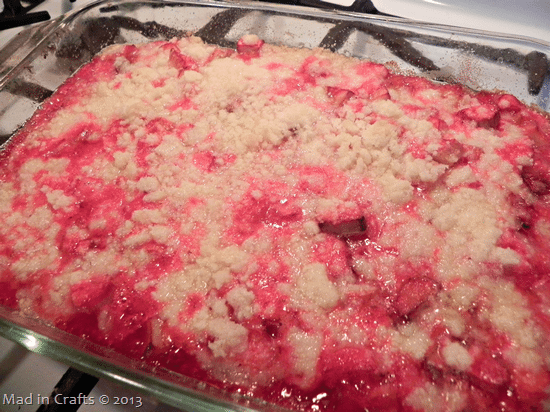 Pour cut rhubarb over the crust and sprinkle with jello. With a fork, mix together sugar, flour, and butter. Sprinkle over top of the dessert. Bake at 375 for about 30 minutes, or until the crust and streusel are golden. 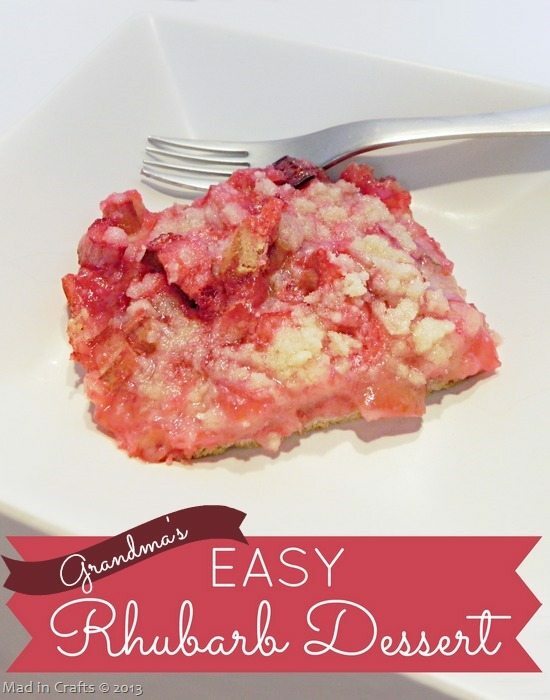 I love rhubarb recipes I’ m real anxious to try grandma’s recipe Thank you for sharing. The package of jello should be a small (3 ounce) box. I set my timer for 35 minutes. We’ll see how that goes.